Seems like there’s quite a lot going on this weekend – and Taste of Abbot Kinney doesn’t really make the selection any easier. This event is for those looking to experience the overall vibe of Venice, since Taste of Abbot Kinney has changed a bit from last year, its inaugural event. One of the differences is that Intelligentsia and Lemonade aren’t participating, but there are plenty other outposts of their product. 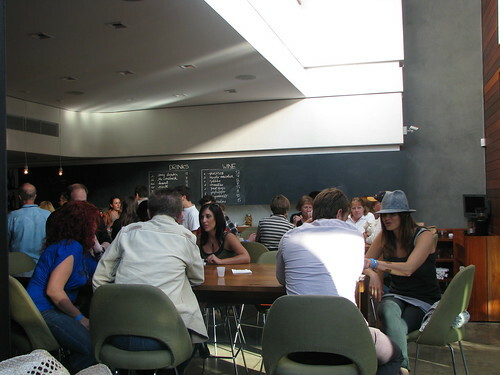 What you can expect is a unique VeniceÂ experience on a Sunday afternoon tailored specifically to you. The biggest difference this year, however, is there areÂ “tasting tickets”Â that you’ll exchange at each venue for food, drink or experience.Â The day, which benefits Inside Out Community Arts, will have options other than food available. Floyd’s will have a mobile haircutting booth, Nite Spa will provide mini massages and everyone is entered to win a 52″ Sony LCD TV, a night’s stay at The Standard Hollywood and more. TheÂ brickÂ and mortar bites I’m most looking forward to have to be Tasting Kitchen,Â Lilly’s, Primitivo andÂ Jin Patisserie. Of course, there will be food trucks – because no L.A.Â food event is complete without them. The highlight will certainly be the Ludo Truck. Dogtown Dogs will be on hand to offer their specialty hotdogs. So, what are you up to on Sunday? It’s safe to say that the first ever Taste of Abbot Kinney can be logged in the books as a success. I had a great time going from restaurant to restaurant (especially in the company of Caroline on Crack, H.C. of LA-OC-Foodventures, Sam of LAist – while running into The Delicious Life and Choisauce), having bites of everything each storefront offered to entice us back on a later date. 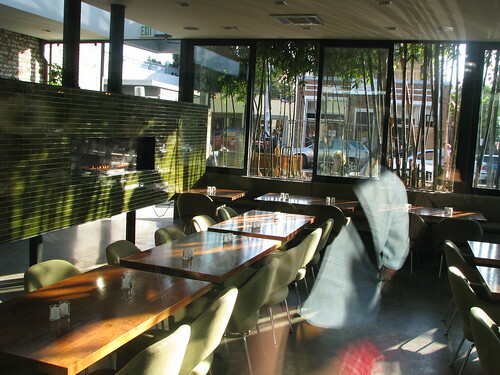 For the most part, the Abbot Kinney restos put in good effort in making sure each guest got to enjoy a decent-sized portion rather than token smidgens. My main qualm was that there could have been more wine and cocktails served for the pairing. After all, regular price admission was $60 per person (or if you were savvy enough to catch the discount on Goldstar, $41 with ticket fee). But there were pleasant surprises. It was my first time at most stops – with mental notes made to revisit Lemonade, Intelligentsia andÂ Tasting Kitchen. Avoid: The Brig – an Abbot Kinney “dive” bar undergoing an eastsideÂ identity crisis, who served up a Brazilian Lemon Drop. It was Brazilian in the sense that it was made with rum, not vodka – but rum is sweet and lemon drops are sour, so the point escaped me. Stick to the 1:2 pours here, as the point of this bar is to knock ’em back rather than to actually taste. The rib from Beechwood served at The Brig, while an unfair gauge on the establishment’s food as a whole, was sweet, average and unremarkable. 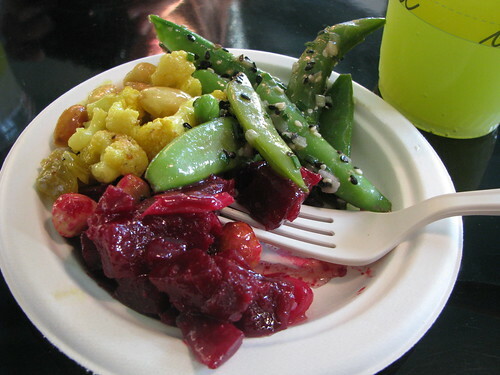 Back to Lemonade (yes, it’s a chain)Â – who gave us a generous portion of their delicious cucumber mint lemonade and a sampling of three salads (above): Sesame vinaigrette atop snap peas andÂ edamame, Hazelnut vinaigrette atop roast beets and pickled red onions, and roast cauliflower, golden raisins and almonds in a light curry sauce. Three salads, three words: Bursts of flavor. Super fresh ingredients. Perfectly, lightly seasoned. Must try it. I hope you bought your tickets for the First Annual Taste of Abbot Kinney taking place tomorrow (Sunday, October 11) – after all, the event is sold out of presale tickets but don’t despair. According to the website, a limited number of tickets will be available on Sunday. But I’m planning on staying the evening, too. I’ll be sauntering back on over to Joe’s Restaurant to top off my tastes and personally witness “Raising the Bar: Battle of the Bartenders.” A collaboration between Joe Miller of Joe’s and John Sedler of Rivera, the competition will showcase the best mixologists from BOA, Church and State, Providence and Comme Ã‡a in addition to the obvious (Joe’s and Rivera). â€¢ The â€œClassic Cocktailâ€ Host bar will supply all traditional spirits and ingredients. â€¢ â€œThe Themeâ€ â€“ Utilizing the Spirit of the Evening, bartenders will create their choice of cocktail while using their own ingredients. Joeâ€™s will be featuring Rum. â€¢ â€œFree Styleâ€ â€“ Bartenders will create a cocktail, using any trick or ingredient they come up with. The actual competition is free to all attendees and you can buy any one of the creations made for $10 per cocktail. 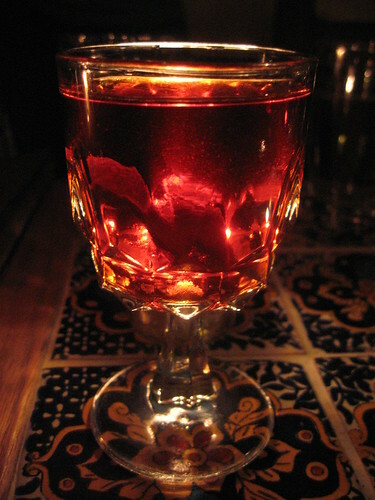 A bar menu of bites will also be made available for purchase to accompany your libation.